It’s time to announce the winner of round 1 and round 2, based on excellent bracket selection and use of our trusty tie-breaker. One participant won both rounds with a crazy accurate bracket selection! The winner after Round 1 and Round 2: Kanoko! 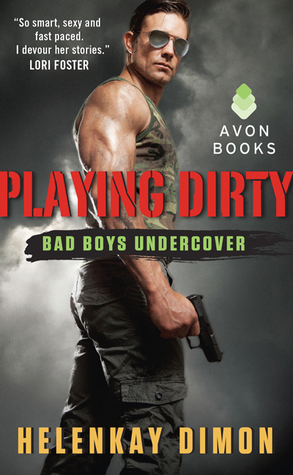 Kanoko wins a $50 gift certificate at winner’s choice of B&N/Amazon/iTunes and copies of RUNNING HOT & PLAYING DIRTY, the kickoff novella and first single title in the new Bad Boys Undercover series from Avon and author HelenKay Dimon! After being burned by her last relationship, Shay wants to take things slow. Yet she can’t keep her hands off the drop-dead gorgeous hottie who’s moved into her apartment building. So when Ford’s identity as an undercover agent is exposed, his betrayal cuts deep. Shay never wants to see him again, but Ford can’t let her go, not when her life is still in danger. He will sacrifice everything to protect her, then be prepared to walk away from the only woman he’s ever loved, even if it breaks him. Kanoko also wins a either a Kindle Fire 6″ or a Nook Glow. Plus downloads of THE VIRGIN’S NIGHT OUT, the KIT COLBANA BOXED SET, the HUNTERS BOXED SET, and an ARC of BUSTED from author Shiloh Walker! Like his brothers Zach and Zane, Trey Barnes thought he had found the love of his life. But fate had other plans. A widower who’s had to raise his five-year-old son on his own, Trey has not allowed himself to be with another woman. Until he meets Ressa Bliss at—of all places—a children’s library program. The beautiful librarian is wonderful with his son, Clay, but every time Trey even considers asking her out, he is tortured by guilt. Fate is indeed fickle. When the two meet again at a conference, this time the attraction is too powerful to resist. But is their connection and passion strong enough to survive Trey’s deep inner torment? You can learn more about Busted at Shiloh Walker’s website. Congratulations to Kanoko, and many thanks to Shiloh Walker and HelenKay Dimon. Good luck in the upcoming rounds of the tournament, everyone!